Canada and other NATO countries must do more to counter Russia's growing and ever-evolving cyber threats, says the head of the North Atlantic Treaty Organization. ​"This is a constantly evolving threat, and we have to constantly adapt," NATO's Jens Stoltenberg told CBC Radio's The House at the Halifax International Security Forum. Stoltenberg says the digital threats come in many forms, and can target anybody. "In some ways, every country is a neighbour of Russia because [a] cyber [threat] recognizes no borders, so you might also say that Canada is a neighbour of Russia," Estonia's Defence Minister Jüri Luik told The House in Halifax. That digital proximity, Luik argued, means Canada should not be surprised if Russia attempts to interfere in the 2019 federal election. "There's no doubt at the moment that we're dealing with a Russian government who has a very aggressive approach towards the West. It's not only the Baltic states, but really, if you look at what's happening in other countries, in big allied countries, interference in elections, in various referenda, I mean, this is a very aggressive hybrid approach towards the West at large," he added. "This is not a game, this is serious stuff." Canada's electronic spy agency has already warned that online attempts to influence or undermine the country's electoral process are on the increase — and that steps must be taken to counter the efforts. For NATO, the priorities are to protect its own networks and counter disinformation. When 400 German troops were in Lithuania to take part in NATO operations, they faced a series of bogus media stories of sexual misconduct aimed at undermining their credibility. 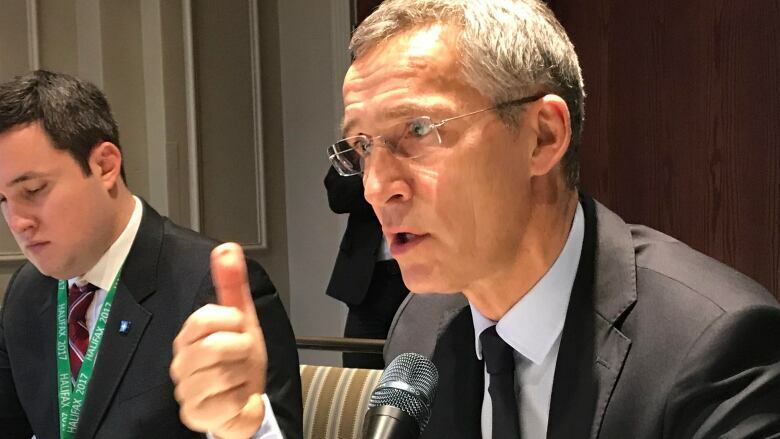 "Before, most of the attacks were on the cyber networks of the NATO headquarters, now we are seeing more attacks against mobile phones of the soldiers," Stoltenberg said. NATO now considers massive cyberattacks on member nations at the same level as attacks conducted with bullets and ballistic missiles, but the organization is still adapting its response.